What did I tell you – it’s now 63 degrees outside!!!!!!!!!!! Matt and I ran 5.0 miles this morning (me in cropped pants and no gloves!). Glorious weather. 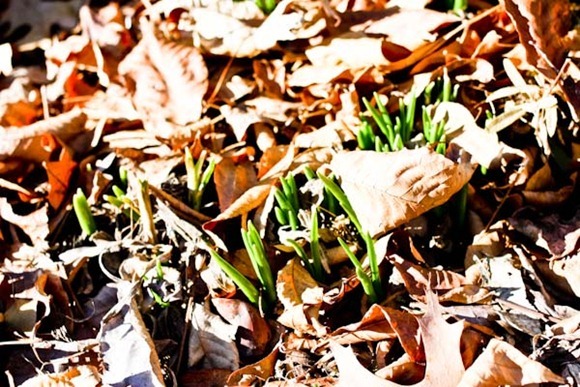 I always consider February the start of spring, even if it means we still have more snow to come. One warm day here and there is all I need to get excited. And then the two of us met Karen for a lunch business meeting. We discussed sandwiches over sandwiches! We were actually a party of four because this stink bug arrived as a stowaway on Matt’s shoulder! We went to Cville Coffee, our new neighbor who also serves up some delicious lunch items. The sandwich was awesome – especially the rosemary bread! BYO water. I recently got this new KOR water bottle on Amazon when my Thermos one broke. This guy rocks. We all shared a donut from Carpe Donuts (another neighbor!) for dessert. It was amazing – cakey and apple cidery. Makes me so excited for the farmer’s market this summer! I don’t start thinking about spring until March and even then, that’s a bit early as a native Michigander 🙂 I can’t imagine thinking about spring in February! That stinkbug brings back bad memories from when I lived in Virginia (Lynchburg). They were ALL OVER the place! Those and ladybugs. I couldn’t stand it. It is really warm here in DC too (relatively speaking) but I can’t accept that spring is coming until all the snow is out of the way! What a great idea adding cranberry sauce! I wish our weather in Ontario were that nice. It just doesn’t stop snowing here! so jealous–it is bitterly cold and very icy here. looks like summer in your photos! enjoy it. I don’t even like donuts and that donut looks delish! Sounds like a yummy afternoon! That sandwich looks amazing…esp. the cranberry sauce! 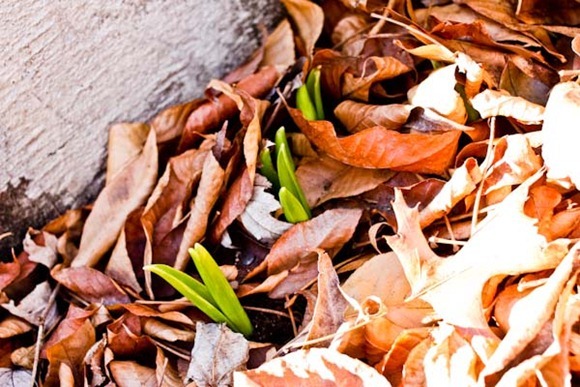 You are definitely from the south if February is the start of spring to you! February is the month of “is winter EVER going to end??? ?” for me! I can’t even tell you how jealous I am of your weather! Ah I’d love to be more than a few hours south right now!! I am so jealous of your weather, Kath. My arms and back are killing me from all of the shoveling I’ve been doing up here in MA. I need a break!!! First, I always think of February as the start of spring too. Second, I like the bag you’re holding. A lot! Third, you have NO idea how good your sandwich looks to me and how much I want one now!! I am so jealous of your weather. It is 18 degrees here. Our local apple orchard makes fresh, homemade apple cider doughnuts. They are *beyond* delicious. That being said, I would gladly trade all the homemade apple cider doughnuts in the world for some of your 63 degree weather instead of our 23 degrees with three feet of snow. Love the sprouts coming up! Outside my window, another blizzard is ripping its way through…I don’t know when I’ll get to plant my veggie garden this year! wow it’s almost as warm as it is in LA here! Cville Coffee looks amazing, like so many other places you feature on your blog … my husband is taking me to Charlottesville on a valentine’s weekend trip, do you have any places that are a ‘must visit’?! Check my Cville page – they are ALL good! PS. If you tell me what you’re looking for I can be more specific! Mas, Tavola, Orzo, Mono Loco, C&O, The Local are all fabulous. 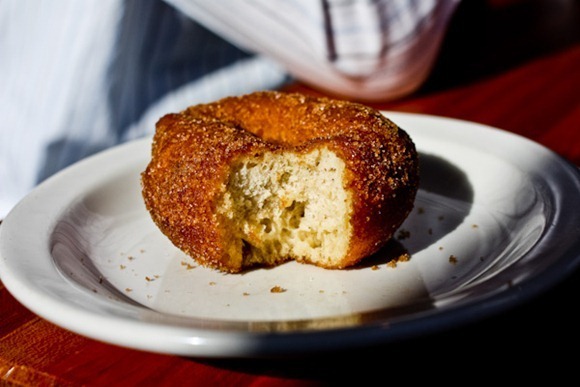 My husband just oogled that donut – I love donuts. I would never have thought to combine hummus and cranberry sauce – savory and sweet though. Love the idea! Dang, I don’t know what looks better…the sandwich or the doughnut? YUM! I love that bag! Super adorable!!! And good luck on the eventual (and I am sure successful) opening of your store! I love that bag! Can’t wait to find out more about it! The water bottle looks awesome too! Ooooh I’m so jealous of your weather!! Love the bag, and the waterbottle too! so jealous of your weather! PS: had some sardines with my lunch today as influenced by yours yesterday- delish! Wow, it’s warmer than there in California! I think the high is supposed to be 60 today. The lunch sandwich sounds great! I’m already thinking about and looking forward to spring too with our nice weather this week. So funny that you guys are in the 60s and we here in Texas are in the 20s today! It was partly sunny and 65 here today in Charlotte! Although, the colder temps are already starting to settle in…. That sandwhich looks sooo good. I love any sandwhich that has banana peppers on it. I always ask for extra!!! I wish I could consider February the beginning of spring! 🙂 It was -40* both yesterday and this morning when I woke up, no joke. That wasn’t even the “feels like” either. Yeesh. That weather is crazy by you!! I wish I could get a 65 degree day. Actually, I would settle for a 65 degree hour! So jealous of that weather Kath! I’m still waiting for the dnage snow to melt! 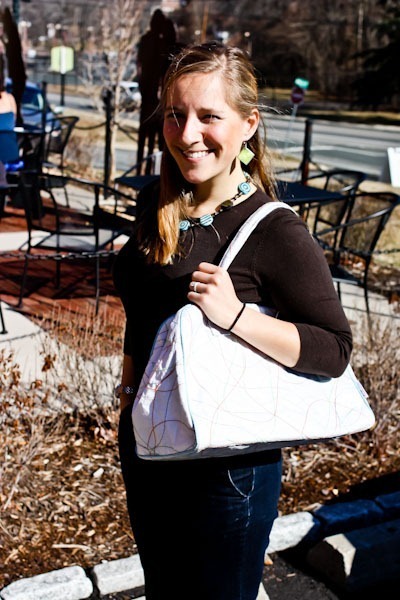 that bag is recycled and fair trade?! cant wait to read more! 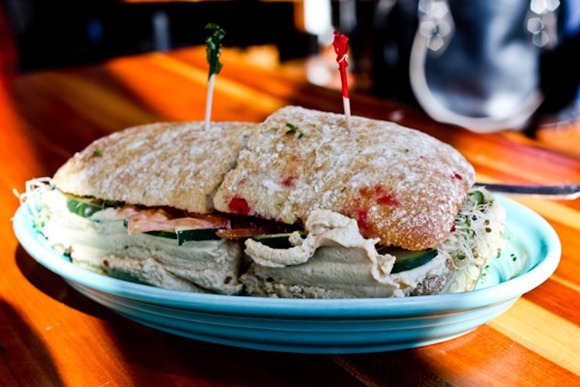 That sandwich looks awesome – I can’t get enough rosemary right now. Hey o – just an fyi – a few blogs on your blog roll are no longer active. It was kind of a bummer to click through. No big deal, just wanted you to know. Thanks Lane. I’m way overdue to edit those! your KOR bottle looks soooo cool! and i LOVE!! that white bag of yours! where did you pick it up? i want it! 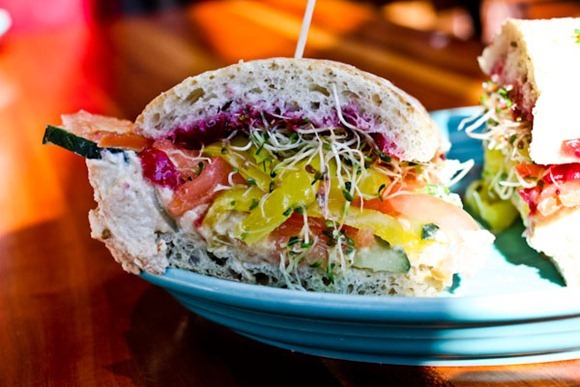 Your sandwich is so colorful! I love it! I went on a run today too! Yay warmness!! Wow, that’s such a cool looking water bottle! 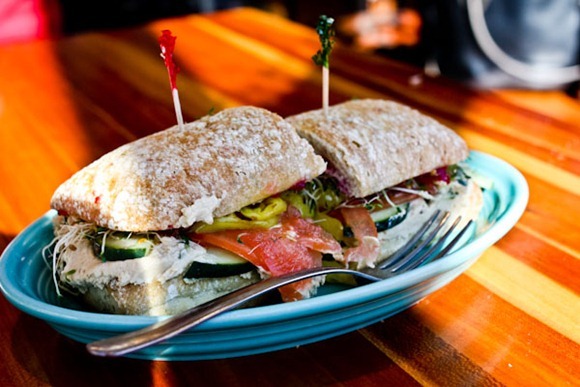 Your sandwich looks packed to the max and delicious, too. I’m sure your Great Harvest sandwiches at your bakery will be even better, though :). Wowee that sandwich looks so good, i love cranberry sauce! Oh I can’t wait until our farmers market opens back up! Hi Kath, I’ve been looking for a terrific water bottle for some time now. Does your KOR bottle sweat? Still digging out here in Chicago but dreaming about your 63 degrees! Brace yourself hon….I don’t think that weather is going to last. Two/three days before we got a foot of snow dumped on us here in OKC….it was 76 degrees. Absolutely glorious weather….and now we have wind chills of -15. Ick. oh I am so jealous of that weather!!! Seriously, Mother Nature is one fickle gal. Ooh, and did hear the verdict from Mr. Groundhog?? Spring is coming! I guess it started today! 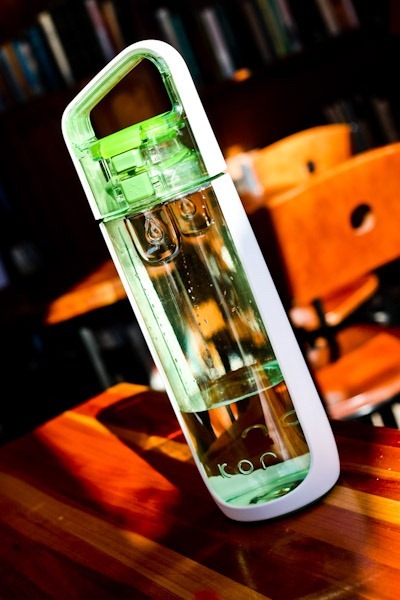 Do you LOVE your KOR water bottle?? We just did a huge custom order of that water bottle for one of our clients. We have one in the office that I am accidentally waiting for it to fall into my bag. Cville coffee is awesome! Try and go to one of their shows! Love that sandwich, looks great. I love build your own. I wish that gorgeous weather would make its way north! I can’t wait to read more about your guys’ bakery! When do you anticipate opening it? that sandwich looks delectable!!! yummy looking bread too. I love my blue KOR water bottle! Cute bag! Mind sending some of that warm weather up to Boston? 63??? So jealous! It’s below zero in MN… le sigh. 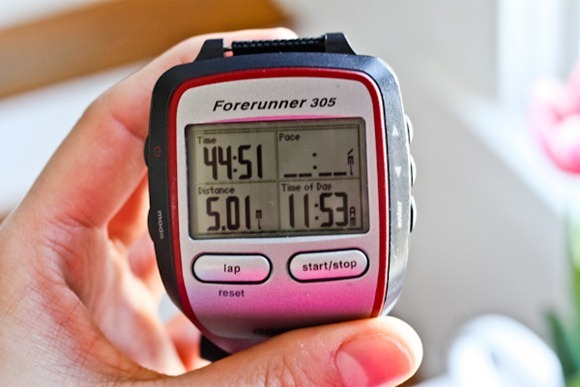 The forerunner looks fantastic, is it a bit bulky for you? From the picture it seems a rather large, but then again it is a close up! I use a polar but the strap does not seem to always pick up my BPM, does the forerunner use a strap as well? Fabulous blog-supremely crafted, well done! Oh gosh, I’m so jealous of your temperatures. I love winter though, but I think I put on half my running gear to go out yesterday!